It's the time of year when one's mind turns to the multiple mythologies of Christmas. Most educated people know that Christmas started out as a pagan festival, and was appropriated by the Christian church to better reach the masses. Chances are that the pagans the Christians stole it from had, in turn, stolen it from an earlier bunch of pagans, and so on, all the way back to a group of early humans huddling around a fire somewhere, seeing in the midwinter. Perhaps they exchanged some kinds of tokens, perhaps they imbibed fermented fluids our modern palates would find disgusting, perhaps they made propitiatory sacrifices to the gods of winter to encourage them to go away, though it's not unlikely that a burning log was involved. So we had people marking midwinter and anthropomorphising the cosmic forces responsible for the season. Then more complicated religious systems came along and said, no, that's not the winter god, that's Zarathustra or Mithras or Sol Invictus. Then, around the fourth century, Christianity came along and decided that Jesus was born on the 25th of December. (Aside: according to some claims, the most likely date for the birth of Jesus would have been in August or September, assuming the thing about the shepherds being out in the fields was accurate.) Then along came secularism and the Enlightenment and Christianity receded somewhat to the background, though not quite disappearing; instead, becoming the default traditional-religious-meaning-of-Christmas which people complain nobody pays much attention to as they go gift-shopping. So what we have today is a salmagundi of several different stories which don't quite fit together. We have, in particular, the Biblical story of the son of God being born in a manger in the Middle East, visited by wise men bearing gifts and so on. 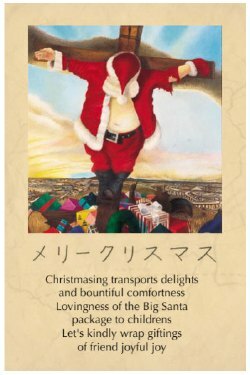 And beneath that we have a completely incongruous Arctic mythology of a fat man in a red suit who lives at the North Pole, rides flying reindeer and delivers presents. In some mythologies, he has armies of elves (an element of northern European mythology) helping him make and deliver the toys (presumably Apple and Nintendo have kindly signed some kinds of intellectual-property licensing agreements with them, allowing them to make iPhones and Wiis in their Polar chip fabs). In the Netherlands, he is accompanied by six to eight black men, whose job it is to thrash naughty children; in Switzerland and Austria, that task is performed by a demonic creature named Krampus. The man is known in English as Santa Claus or Father Christmas, though is generally identified as Saint Nicholas, a bishop from fourth-century Greece who is unlikely to have ever seen a reindeer. Similarities between Santa Claus and St. Nicholas of Myra are largely coincidental; some say that the bearded Arctic-dwelling man is derived from the Norse god Odin. Meanwhile, in Russia, he is known as Grandfather Frost, and in Finland, his place is taken by Joulupukki, the Yule Goat (which is actually a goatlike creature; the Finns are nothing if not metal).. It would be complicated enough with just these two very different mythologies, awkwardly joined at the hip. But in the 20th century, as Christmas became an ever-greater secular and commercial milestone, even more elements were added. The general rule seems to be that anything goes, as long as it's vaguely wintery or snow-related. We got supernaturally animated snowmen (Frosty the Snowman, of the popular Christmas song, and Raymond Briggs' snowman), which have nothing to do with either Christianity or the old Nordic pagan mythologies. And more recently, other remotely polar elements have been appearing on Christmas cards, such as penguins. These, of course, live in the Southern Hemisphere, but if a fourth-century Greek bishop can travel the globe by flying reindeer, surely he can have a few penguins in his entourage. And I wouldn't be too surprised if, one of these years, someone threw in a polar bear or two for the more ecologically minded. For instance, an understanding of cold reading would have helped me a great deal. I never knew what cold reading was, and until I saw professional magician and debunker Mark Edward use cold reading on an ABC News special last year, I didn't understand that I had long used a form of cold reading in my own work! I was never taught cold reading and I never intended to defraud anyone - I simply picked up the technique through cultural osmosis. People in my culture have heard you and we're trying to answer - but we don't understand you. Our cultural training about the dangers of the intellect makes it nearly impossible for us to utilize science properly - or to identify your intellectual rigor as anything but an unhealthy overuse of the mind. Meanwhile, a revert war seems to have opened up in the Wikipedia entry on Witchcraft; it started when a bunch of fuzzy-bunny pagans took offense with the part of the article which contradicted their belief that witchcraft was the same unified, benign and generally warm and fluffy thing throughout centuries, rejected the validity of all the sources cited for this (partly because the "secret oral tradition" they know says otherwise, and what would some stuffy academic who's not part of it know? ), and vowed to enlist their friends' help to ensure that their point of view prevails. He wasn't Irish, he was Roman. There never were any snakes in Ireland. "Driving the snakes out of Ireland" is a euphemism for leading the slaughter of the indigenous Celtic pagans. Now, tomorrow I'll be wearing green to celebrate the arrival of spring, and surely I'll raise a pint or two of Guiness in honor of the Emerald Isle. But an Irish person celebrating "St. Patrick's Day" is as absurd as a Mexican celebrating "Cortez Day." Neopagans themselves mix all sorts of spiritual ingredients -- and not always consciously. Many carry baggage from the churches they've supposedly rejected. "The former Catholics are the ones that are into the big ceremonial magic, because that's what they grew up with -- the big Catholic ceremonies," argues Ceredwyn Alexander, a 33-year-old pagan (and former Catholic) who lives in Middlebury, Vermont. "And the Baptist pagans tend to be the rule-oriented pagans: 'You must be facing the east at this particular time of day, and anything other than that is evil and wrong!'" So it was that in 1993 members of the Order of the Red Grail, a Wiccan group in Nebraska, held an "experimental magickal working from the High Elven point of view," drawing on the world invented by Tolkien. And so it was that in the mid-'80s some occultists in California -- not a pagan group, my informant stresses, though there were some pagans among them -- attempted to channel the Amazing Spider-Man. The collective unconscious was probed, and a persona claiming to be Peter Parker emerged; the magicians then tested the alleged superhero by asking what would take place in the next few issues of the comic book. Alas, the channeler's predictions proved inaccurate, thus nipping the project in the bud. One person's High Elven is another person's High Elvis, of course; "Elvis miracles" have been reported for decades now, and there are "serious" Churches of Elvis. There's even a book about "Elvis spirituality". And then of course are the Jedi; sure, most of them put "Jedi" on their census forms just for the hell of it, but there are surely a few who find deep spiritual meaning in lightsaber battles and dyslexic muppets. Such playfulness marks the so-called Free Religions. Under this header one finds Discordianism, the "Non-Prophet Irreligious Disorganization" devoted to the Greco-Roman goddess of disorder; the Church of the SubGenius, inspired not by classical mythology but by conspiracy theories, UFO cults, and sales manuals; and the Moorish Orthodox Church, which might best be described as Discordianism crossed with Afro-American Islam. Other Free Religions are one-off efforts, sometimes launched by followers of other free faiths. That seems to be right; what Discordian or SubGenius hasn't at some stage (and often under the influence of various substances) declared themselves on a whim to be the High Pope-God-Emperor of the First Universal Church of Spray-On Cheese or something? A while ago I was thinking that, while memes like that occur everywhere, the placing of them in a religious context seems to be a very American idea. I.e., if Discordianism originated in, say, England or France (or even Australia), it probably wouldn't classify itself as a religion; perhaps it would be an art movement, or a philosophical experiment, or perhaps just a meme, a signifier marking out those In The Know.